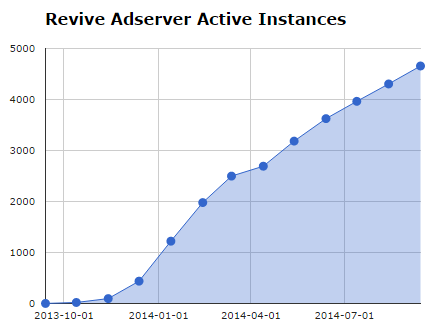 On September 13, 2014, Revive Adserver project team leader Andrew Hill celebrated the one year anniversary of the project in his blog post title Revive Adserver – One Year On…. He looks back at how the project came to life in the first half of 2013, how the team grew and prepared for the official launch on September 13, 2013, and what happened next. A few days later, I posted how the installed base of the software has grown over the first year. On launch day, we started from scratch, and 6 months later, there were 2,500 known active installations around the world. Another 6 months later, we are able to report that there are now as many as 4,657 active installations world wide. I think this is an amazing achievement for a small team with virtually no marketing budget. Congratulations to the project team, and to the community!